Many app developers define the success of a mobile app by the number of installations. But app downloads are similar to unique page views – there can be a lot of people viewing your website, but only a few of them will convert to customers. Another metric – more important than the number of downloads – is how many people come back to your app the next day, week, or month after they install it. This metric is called retention. Let’s imagine that 100 people install your application. 35 of them will use your app tomorrow, but only 2 will still be using it two weeks later. The retention rate in this case is 35 percent on the second day and 2 percent by the end of the second week. Increasing the number of app downloads is undoubtedly important, but keeping retention rates high is what developers should be focusing on. A high retention rate means that people are loyal to your product – and I’ll let you in on a little secret. Sometimes loyalty can be fostered by being a little pushy. According to Localitycs, in the previous year, people who allowed an app to send push notifications to their iPhones or Android phones used that app three times more often than those who turned push notifications off. Push notifications enhance the user experience by delivering valuable personalized messages at just the right time and in just the right place. Successful apps use several types of push notifications or mobile alerts. Let’s discuss some specific examples of push notification for your mobile app. Push notifications that are sent after a specific activity are called mechanical. This type of notification is triggered by a user action or a predetermined time or event. 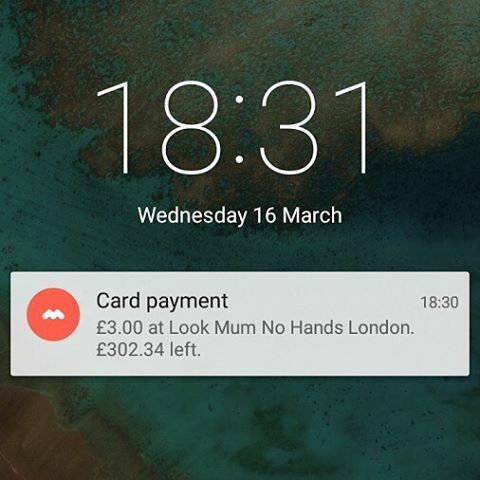 Monese, a finance app that lets you register a bank account in the UK, sends mechanical push notifications showing the current balance on your account after you’ve paid a bill, for example, at your favorite cafe. If an app is integrated with a calendar, it can send reminders every time a user has an event planned. 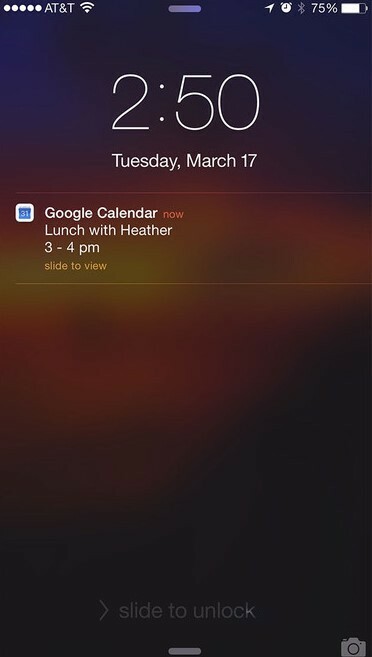 Here’s a classic example of this type of push notification from Google Calendar. 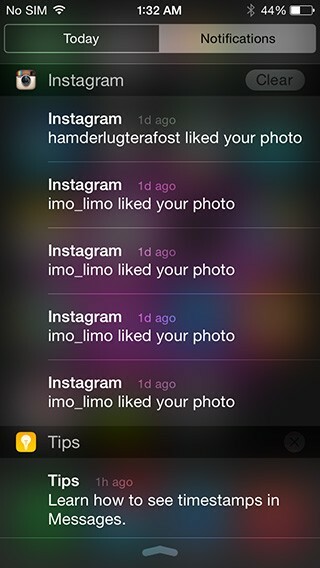 When somebody likes your photo on Instagram, you receive a push notification. Such push notifications also fall in the mechanical category because they’re prompted by a simple event – in this case a like. Another example of event-based push notifications is a new match in dating apps. 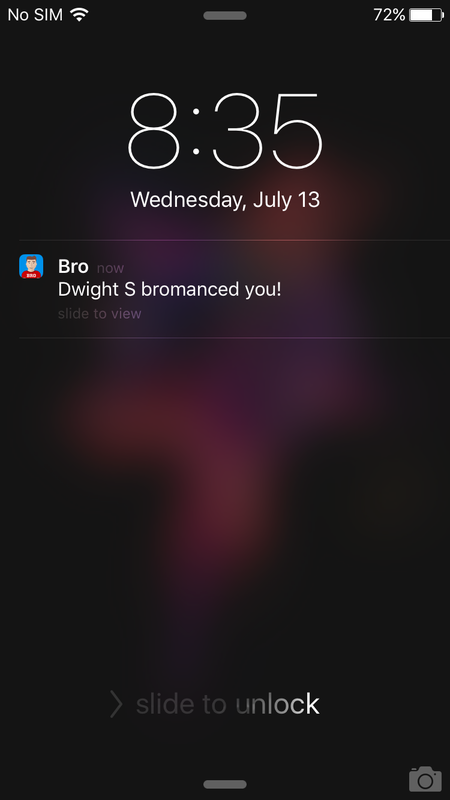 Check out how this works with the BRO app, a dating app for men that we developed for our US-based client. Mechanical push notifications are used in a wide variety of apps. They have a simple logic. To set up mobile app push notifications you can use third party tools such as Parse, Localytics, and Kahuna. Read more about push notifications integration in our article: How do mobile app push notifications work? Have you seen the first two seasons of Sherlock? If you have, then Netflix will notify you when the third season comes out. Would you like a personal stylist who can recommend clothes based on your personal taste? That’s precisely what H&M offers. H&M uses deeply personalized behavioral push notifications to increase sales. They act as a personal stylist, offering items that go great with your latest purchases. There’s no guarantee that a user will buy these cute boots, but they’ll probably at least open the app to check them out. A distinct subset of behavioral push notifications are the so-called “cheer up” notifications that recognize a user’s achievements and encourage them to keep going. 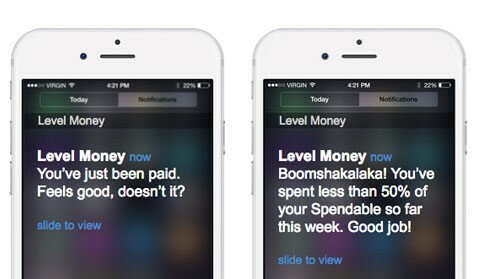 Level Money, a financial application that helps you achieve your financial goals, sends fun and supportive push notifications to encourage you and make you smile. They paid close attention to the text of these notifications. Who wouldn’t smile after receiving a “Boomshakalaka!”? Some behavioral notifications talk to you like your mom or trainer. Fitness apps, activity trackers and educational apps often use this type of iOS and Android push notifications. 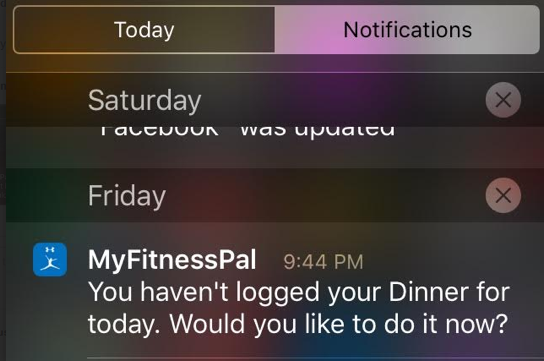 MyFitnessPal, for example, will kindly remind you if you forget to log a meal. 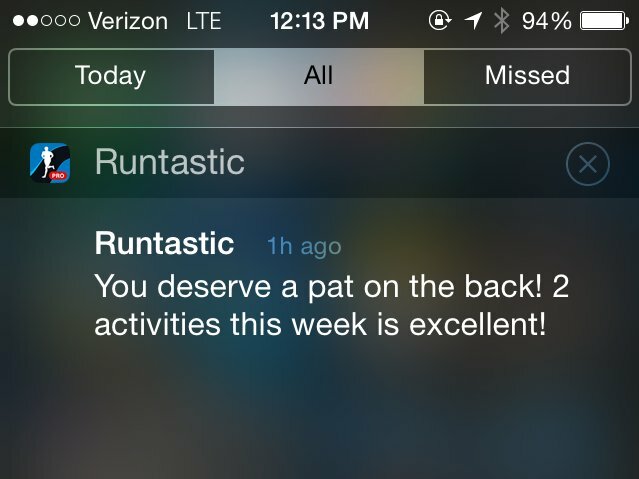 Runtastic will recognize your efforts and give you a (textual) pat on the back. These notifications are designed to put you in a good mood. Sometimes you might even want to answer: “Thanks dude!” Runtastic has many loyal users. After all, who would uninstall such a friendly app? Behavioral push notifications are personalized, and in most cases have a better impact on increasing retention rate. According to the latest Leanplum report, personalised notifications based on user behavior have an open rate eight times higher than generic notifications. Location-based push notifications show up when you go to a certain place. These notifications are especially useful for shopping apps. Vouchecrcloud is your shopping companion. It sends local-based notifications about the best product offers. If you’re interested in mobile opportunities for retail, you might like our article about loyalty app development. Aside from store promotion, there are a lot of other opportunities to use location-based automated notifications. Check out several examples below. 1. “Welcome to Paris!”, “At Starbucks?” If you use Foursquare, you probably recognize these questions. 2. 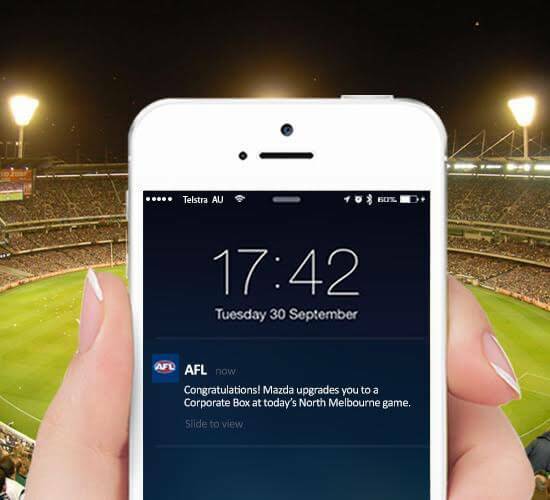 The Australian Football League app used Bluetooth Low Energy (BLE) and beacons to engage their fans in a football stadium. They deployed beacons to send push notifications asking fans for feedback regarding cultural diversity. The results of this campaign showed that the survey achieved a 10 times higher response rate compared to the 3 percent response rate without beacons. How can you determine the right push notifications for your app? What is the value of the information sent in a relevant push notification for your users? What should your users do after receiving a push notification? What events in the app can you tell your user about? What can you offer or suggest to users who exhibit a certain behavior for re-engagement? What can you offer to users in a specific area? Try out different ideas, measure your results, and boost your retention rate! How Do You Develop Brand Voice for In-App Communication?